Nestled at the base of Blackcomb Mountain in the Whistler upper village area, the luxurious 550-room Fairmont Chateau Whistler defines mountain luxury. With true ski-in and ski-out convenience, the classic elegance of this landmark Whistler hotel offers a modern alpine setting for unsurpassed guest service, exceptional dining, full ski resort amenities and Fairmont Gold - Fairmont's exclusive lifestyle hotel experience. Tastefully designed rooms with spectacular mountain or village views were created to blend with the natural alpine setting. 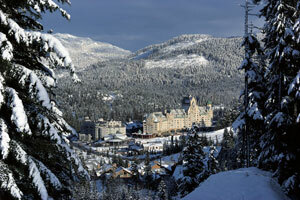 No wonder celebrities choose the Fairmont Chateau Whistler as the place to stay for their Whistler ski holiday. Contact us for more information or to book this Whistler hotel. Experience the ultimate in service! Available Gold Floor Rooms located on the 8th floor include the following room types: Fairmont, One-Bedroom, Premier Suite, Executive Suite and Penthouse Suite.